What is that in our backyard?! Nirvana has become a stranger that we can't wait to get re-acquainted with. Recently I posted our haul-out expenses and our pre-cruising expenses. 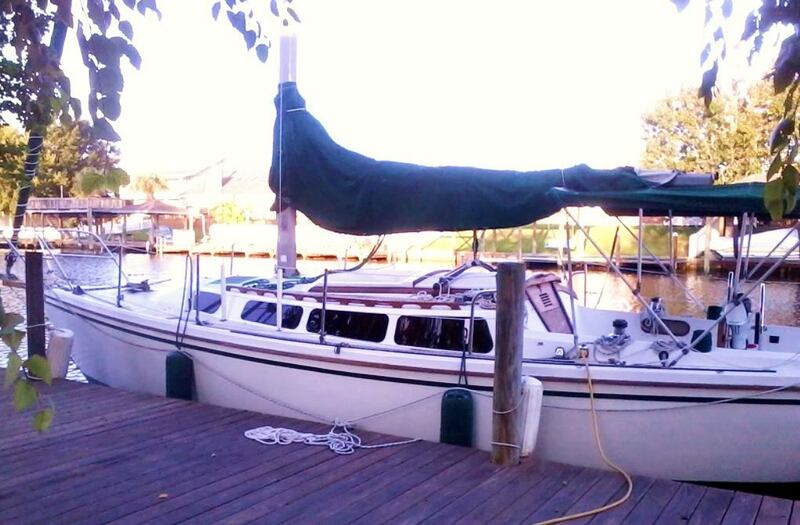 I wish that our pre-cruising expenses list was complete, but instead it will grow significantly once our house sells. So, in case you were wondering what we plan on adding to Nirvana in preparation for cruising ... here's a list of what I've come up with so far. I'm sure this list will also grow, and it will be interesting to see how it compares to reality. This list is in no particular order, but I separated the projects from the add-ons. I put a question mark by the items that we'd like to have, but aren't sure about. We'll go without them if our budget requires it. *These projects will keep us busy after our house sells, but Ken can build a house in 3-4 months so once we start on these projects we'll knock them out pretty quickly ... a few months. Cockpit Cupholders (we have none)! Propane Stove in Place of Alcohol Stove? Products We Hope Never To Use ... such as hole fillers, plugs, etc. We gotta eat and drink, so there will be lots of canned nuts, canned tuna/chicken, pasta, peanut butter, beer and wine stashed away somewhere. All that beer and wine (and rough seas) will require a collection of Ibuprofen and other over-the-counter medications. Oh, and lots of sunscreen! Whew ... we've got to sell our house soon. All of these things really add up! At least we'll be accruing a ton of credit card travel miles when the time comes. You know, there's registries for weddings ... how about a registry for bon voyage parties? That's something I may think about. So, what have I missed that you wouldn't leave without? I didn't try to list every little thing, but we'd love to hear your suggestions. You have all the emergency equipments like lots of flares, mirrors, safety vests and the like. I'm sure you do. You've quite a list, but that's what it takes. You'll figure out what you need and what you don't. First aid kit should be tons of stuff. If you're out in the nowhere you need to have more than most first aid kits have. Be careful of the weight. A 30 ft boat has its limits. Scotch the TV and just use a laptop. I never used my anchor windlass on Satori and I had a 45lb CQR with 3/8 in chain. Just pulled it in by hand. Going small also means going simple. Less work in paradise that way! * Yup, loose the TV. But do get some up-grade speakers, like Bose. * I threw my Solar Shower away. Better to heat water in a pot. * I prefer Precast FRP sheet to Starboard for most things. I can often find cut-offs around the yard. Also consider Coosa board. * Corr-Block tested best against wire corrosion (PS). * Wasp spray as a weapon is urban legend. Google. It doesn't even sting. The list is going to need some trimming, just for space. You'll work it out, I have faith. I can relate to lists like this! We forwent an Electric Windlass, and got a mast mate instead of mast steps. There are a million and one things I could think of buying to get our boat "ready" as we think we'll need it, but we are really trying to adopt the whole "don't buy it till you KNOW you need it" attitude when it comes to certain things. I'm assuming when you leave you'll go down the coast of Florida where you'll find TONS of boat shops with used and discounted items. There are many items we are going to wait to see if we need when we get to FL. +250 for the Cockpit cupholders. We don't have any either and I really really can't wait to get some. Here's to both of our lists getting smaller. I would delete the question mark next to EPIRB! That is the single most important piece of safety equipment you can have if you plan to do any offshore sailing! As you start cruising you will find you need less and less of the "recommended" gear. Good luck on the transition! Sandee, we'll definitely have safety on our mind! Alex, you're not the first to tell us of the importance of the EPIRB and we're listening. Offshore sailing ... not in the plans (yet)! LCP, we've seen the canvas buckets and hope to get somebody to sew us one someday. The plastic bowl/bucket for laundry .. definitely! Drew, we've never heard of Coosa board before. Will have to look into that and the FRP out for starboard alternatives. The less teak on the boat, the less maintenance! You've got quite a list there, but pre-planning is key and will help ensure success! You mentioned music and movies. One recommendation I have is instead of using external hard drives to store digital information, use high capacity USB flash drives. There's no moving parts like hard drives that will surely fail. I've already got my music and movie collections on 128GB flash drives. They're a little more expensive [per GB] than a hard drive, but won't fail nearly as easily. Hang in there and you'll be back out in no time at all! You're gonna need, not just want, a dodger. When you get into some weather and you will, you'll want to be able to open the companionway hatch to go below whatever.Don't want rain or seas dumping below. You can leave the hatch open some too. You can duck behind when you need too. Gives you lots of protection. Your bimini should have a piece made for the aft end of it that zips or attaches with snaps to top and ties down to stern for anchoring. You're nose the trades and the sun goes down and bakes the cockpit, you and the companionway. And later, a large awning from mast to backstay and side to side with side curtains. When you live in the tropics, these are things that keep boat cool. On the bow a canvas piece to tie to forestay and/or pulpit and go back to mast and tie on side lifelines or stanchions. NO wind scoop. With the canvas you can leave fwd hatch open in all but blowing sideways rain.When sleeping, if it rains, don't have to jump up and get wind scoop off and close hatch. Mike, I don't know much at all about hard drives vs flash drives. I've been under the impression of just the opposite .. that flash drives would go bad. Thanks for the info! Kaarin, we plan on adding zippers to our bimini next Spring before we leave to add shade/wind/rain protection and we hope to have a tarp as for shade over the hatch area. We hope to have a dodger in the future, but we really are on a shoestring budget ... I know there are boats out there with a lot less.